Well, it’s good to be back home after a nice getaway in St. Lucia. Please check out my previous blogs for my day-to-day adventures. I’ll have more to say in a future blog. One of the first things I needed to do when I got home was to have a look at food items I needed to re-stock…and bacon was high on the list! 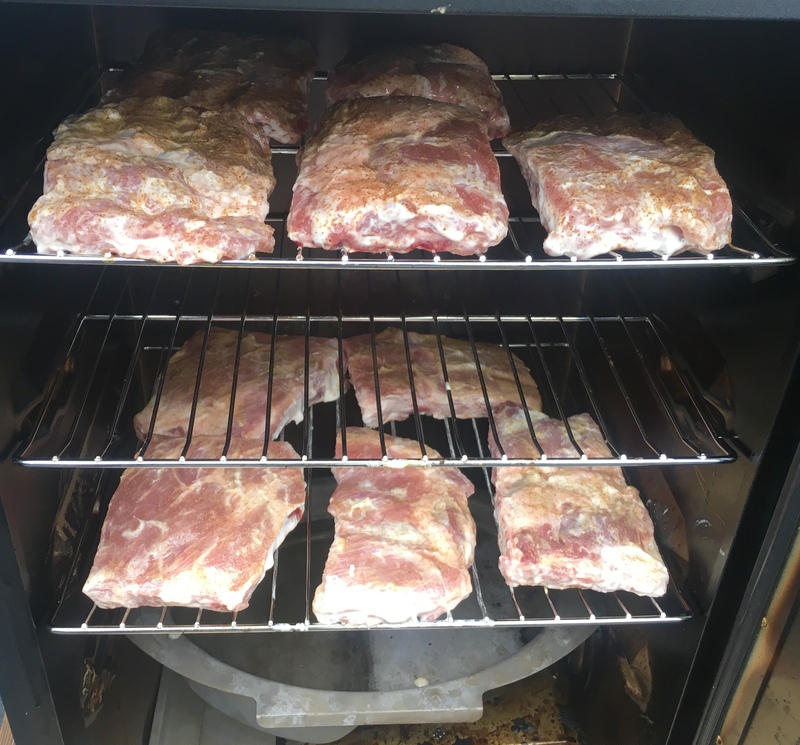 Fortunately, I started curing a beautiful slab of Berkshire pork belly a couple of weeks ago, and it was ready for the smoker today. With the doors open here at home, I can smell the hickory wood wafting through the yard. Hope I’m making the neighbors jealous! 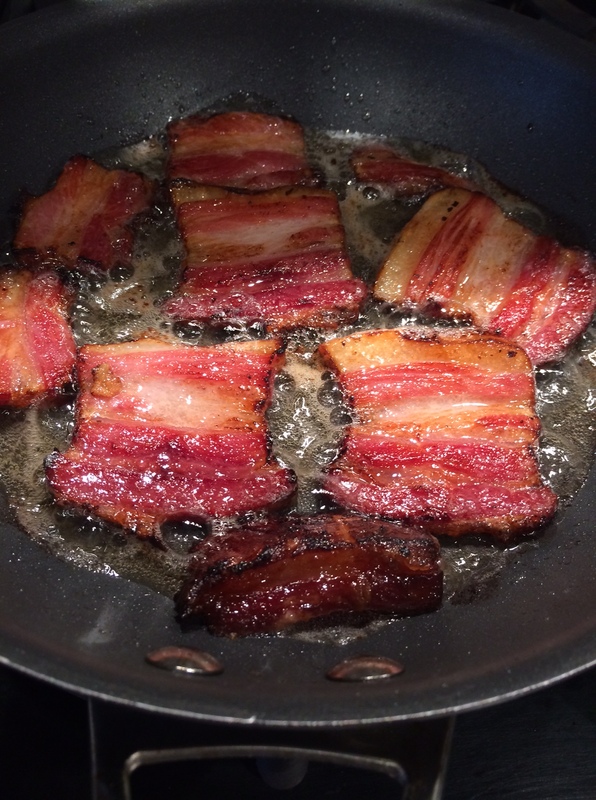 Let’s face it: there are few foods as magical as bacon. Add bacon to just about any dish you’re preparing, and it elevates it to incredible new heights of flavor. The BLT is possibly the greatest food combination ever invented: just a few simple, fresh ingredients, when placed together, transforming into one of the greatest sandwiches on planet Earth. 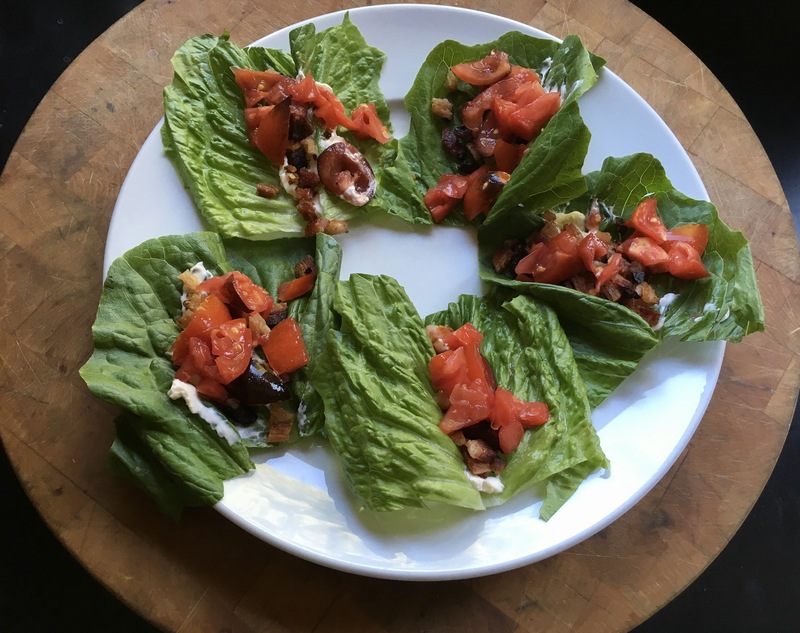 BLT wraps: home-cured and smoked bacon, local farmstead romaine, home garden tomatoes. But nothings beats making your own. 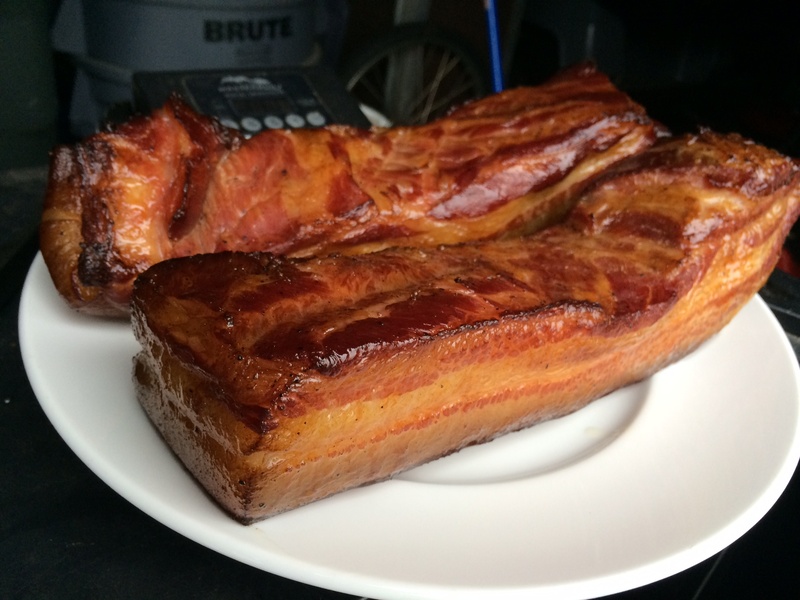 Bacon comes from the pork belly, and they’re easy to find in any good butcher shop. But to get something a notch above, I’ll buy a heritage breed, like Berkshire pork, from Heritage Pork International. (www.heritagepork.com) I follow the simple curing techniques outlined in “Charcuterie,” a great book written by Michael Ruhlman and Brian Polcyn. Mix the ingredients well. An important note: all salts do not all weigh the same, so go by the weight and not a cup measurement. I keep this basic dry cure stored in my pantry, ready to use when I need it. When it’s time to be making’ the bacon, I combine the above rub with other ingredients to make my bacon rub. Mix these ingredients well (yes, there’s quite a bit of sugar there, but I like my bacon a little sweet!) Rub it generously all over the pork belly. 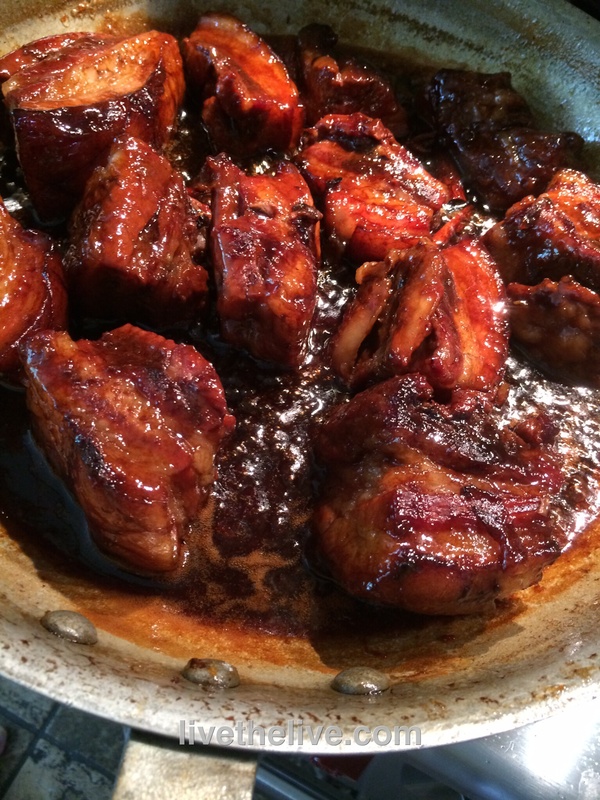 I have a large plastic container with a lid that fits one slab of pork belly perfectly. I place the belly inside it, put the lid on, and place the container in the fridge. The pork belly stays there for at least a couple of weeks, maybe three. I flip the belly every few days. You’ll see that the salt will draw moisture out of the meat and form a brine. This brine will continue to cure your pork belly, so leave it in there. Just flip it, put the lid back on the container, and back in the fridge. 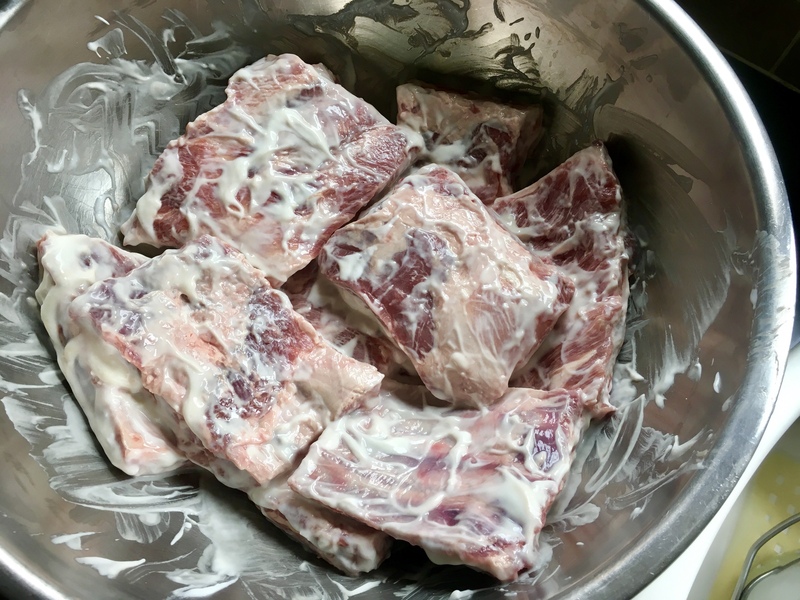 In two or three weeks, once the pork belly has been cured, wash the brine off the meat, and pat it dry with paper towels. Now it’s time to cook. 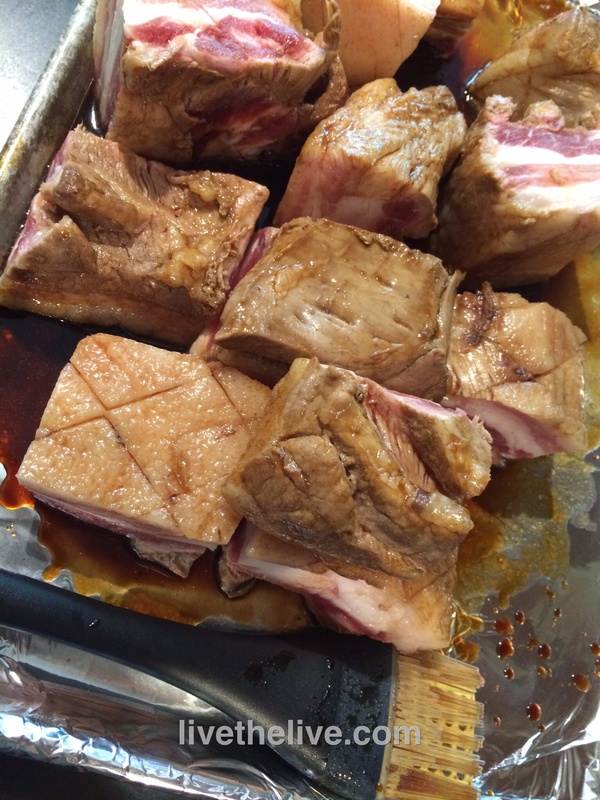 You can simply cook the pork belly at 200 degrees for about 2 hours, until the internal temperature reaches 160 degrees. 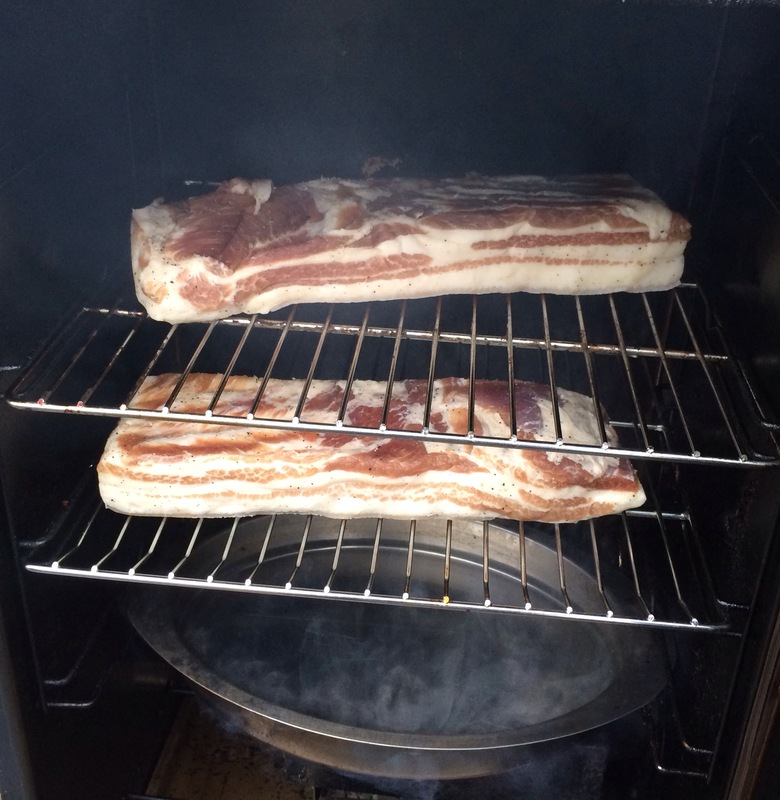 I place the pork belly in a digital smoker, which allows me to set an exact temperature. 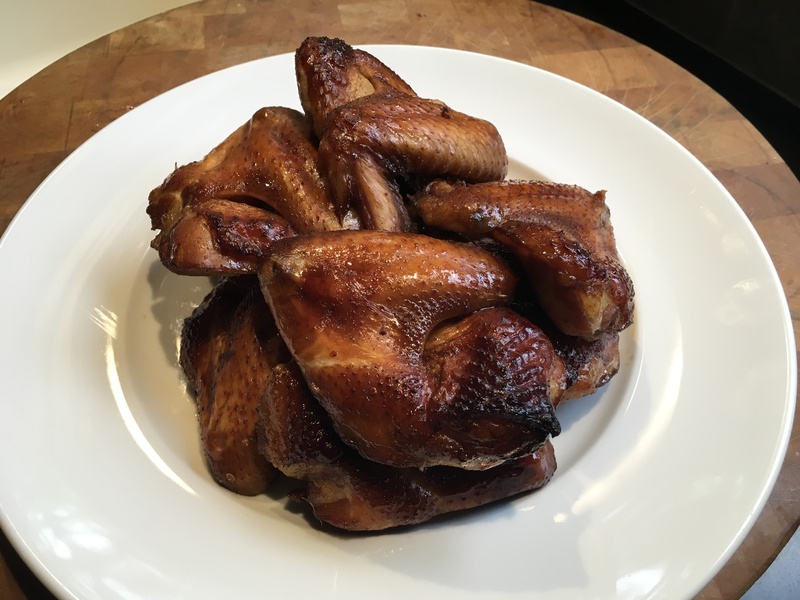 I smoke it at 250 degrees for 2 hours, using hickory chips. That’s it. You have achieved bacon! The reward is so worth the effort. Just remember that you still need to slice the bacon and fry it. Don’t eat it straight out of the smoker. That first slice you cut off your bacon and toss in a pan to lightly fry for a few moments will be the best bite you’ve ever had in your life! And if you’re making one slab of bacon, why not make it three or four? It freezes well. And…you will eat it. You know you will! I love pastrami. I love ribs. So why can’t the two get along? (Using my best announcer voice): Well now they can!! 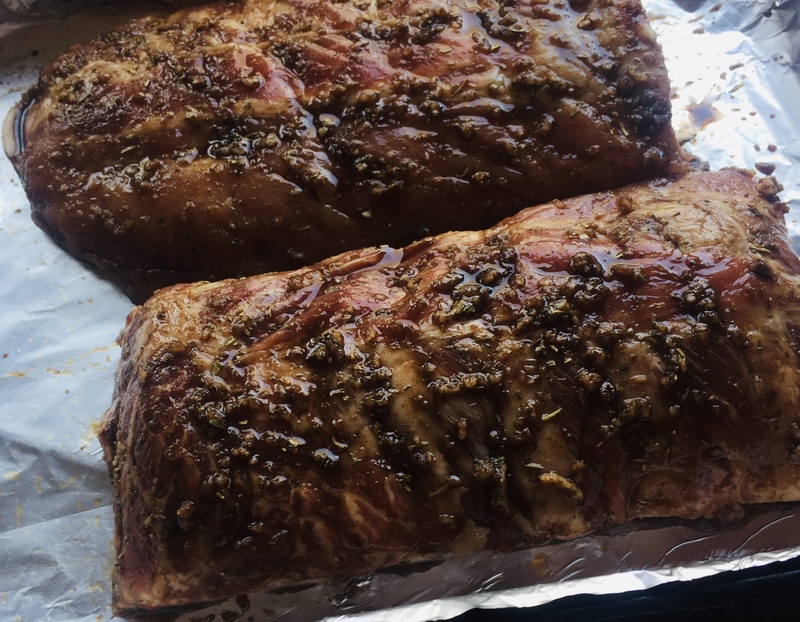 I’ve seen a few recipes that use pastrami ingredients on foods other than pastrami and I thought it could work with pork ribs as well. I was right. 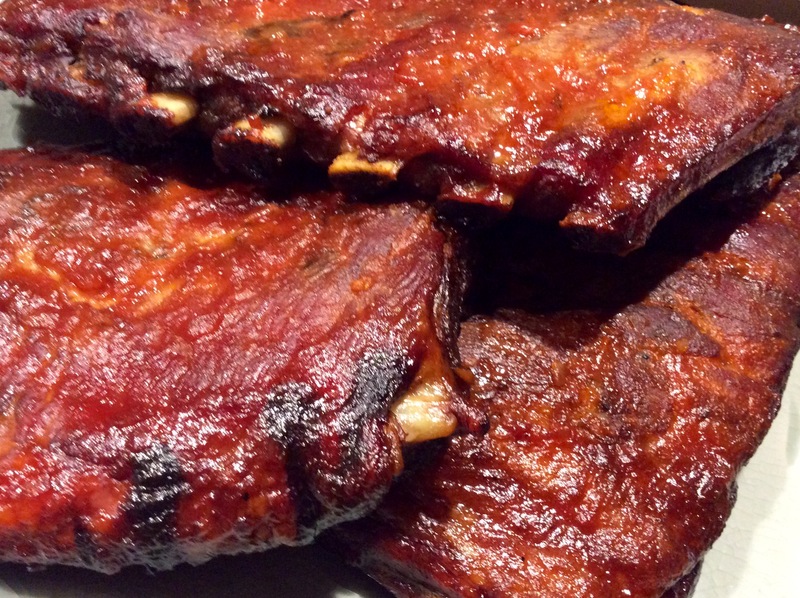 And for these ribs, you don’t need a smoker or anything like that. They bake in the oven, then get finished under a broiler for that tasty char that you always look for in a grilled rib. 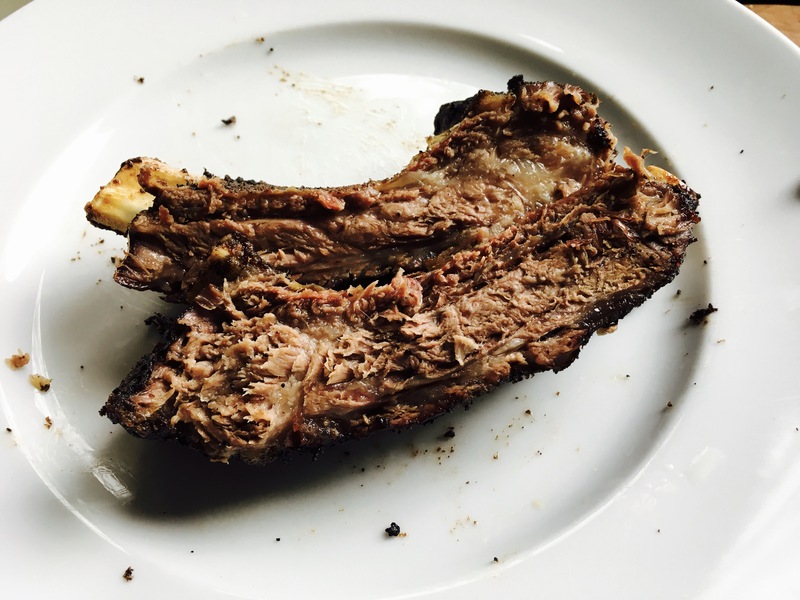 There’s a 2-step process to making these ribs. First, you combine the rub ingredients and let the ribs hang out in the fridge overnight. 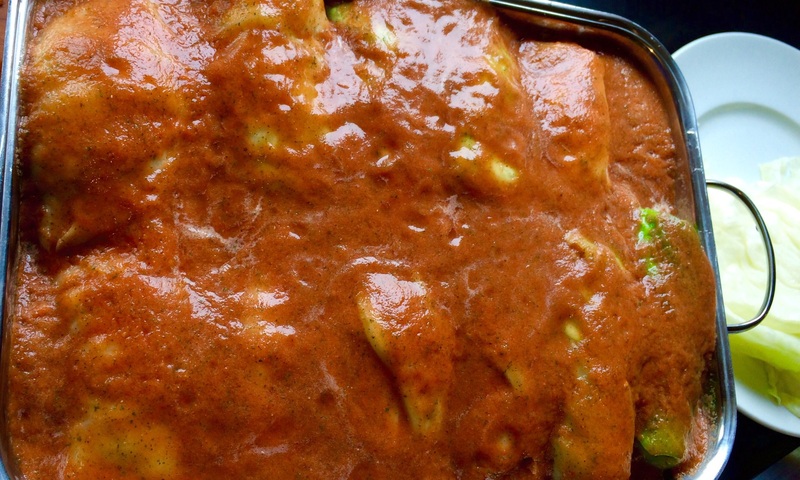 Then you bake them and broil them the next day, brushing a special sauce on them. 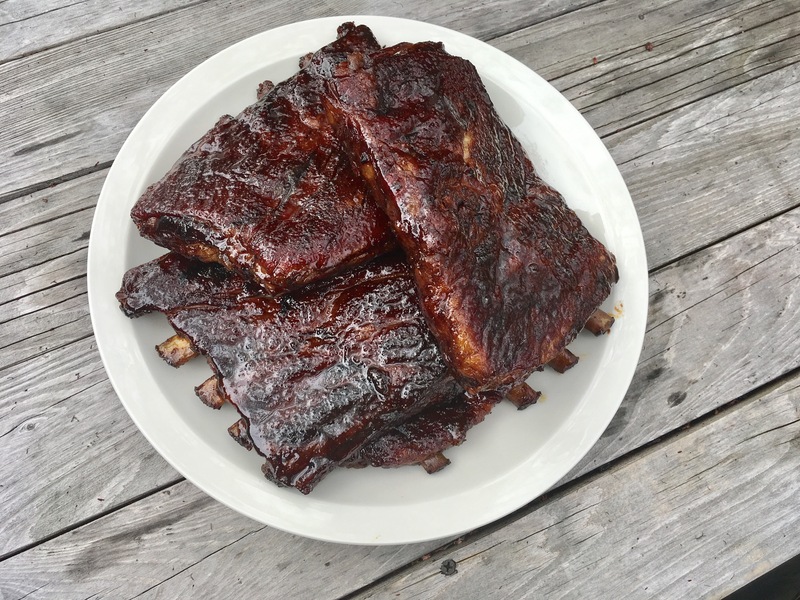 I prefer St. Louis-style ribs because they cook more evenly and have lots of meat. 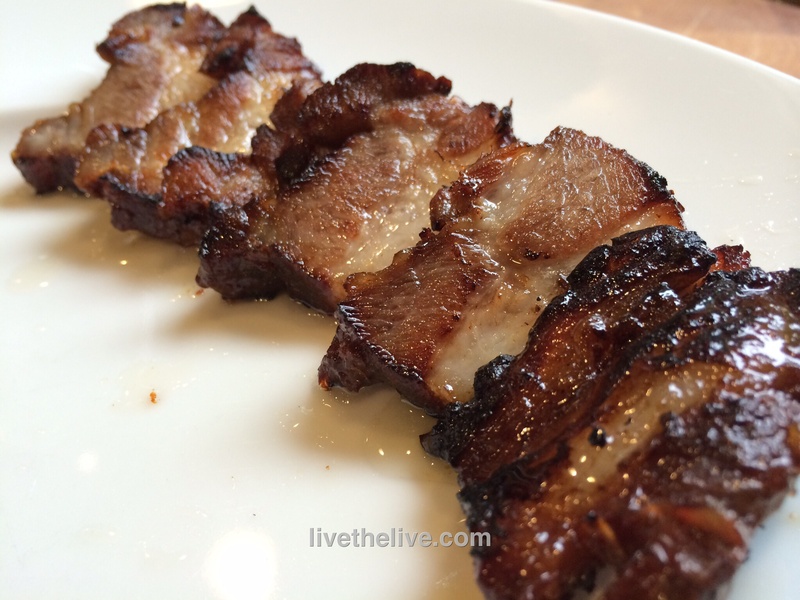 I prefer a heritage breed like Berkshire pork (also known as kurobuta) because of it has fantastic flavor, “good” fat, and is humanely raised. To make the rub, combine the black pepper, coriander, brown sugar, mustard powder, paprika and cayenne in a bowl. Mix well. To grind larger amounts of pepper and other spices, I use a small coffee grinder that I keep just for spices. 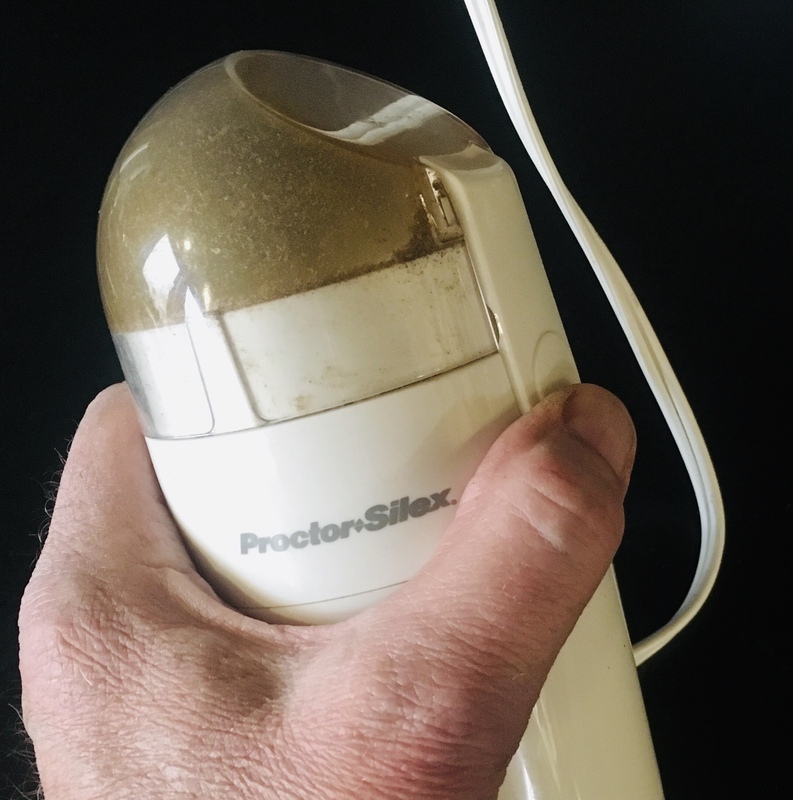 It does the job quickly and easily. Cut the racks of ribs into halves, removing the skin on the back of the ribs that can make it tough. 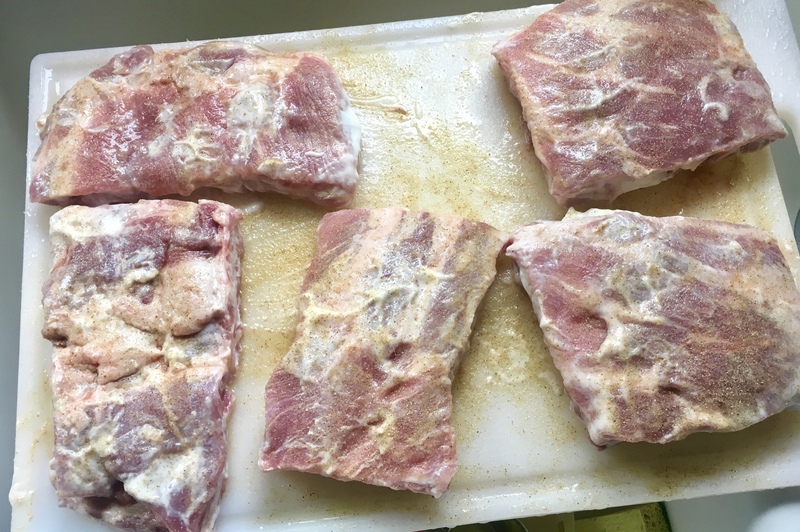 Brush both sides of the ribs with the white vinegar, and then season with the salt. 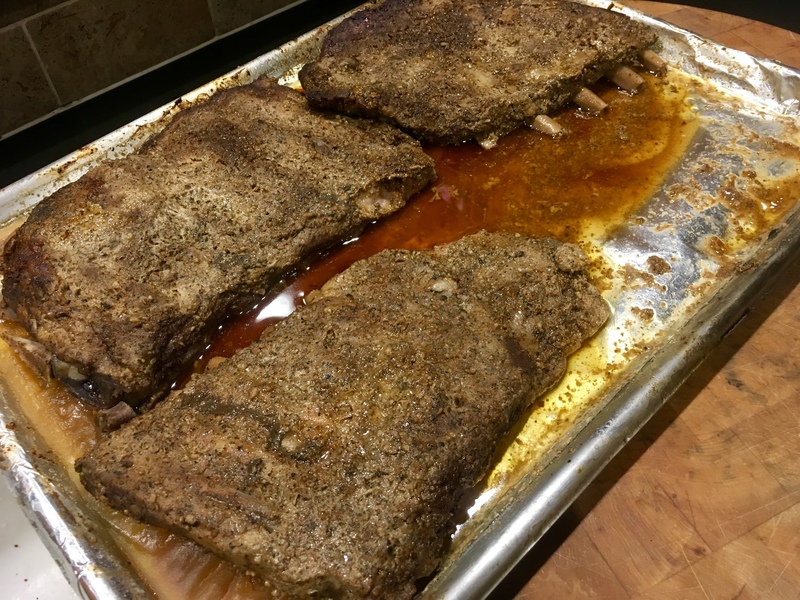 Pat the ribs with the spice rub, and place them on a rimmed baking sheet. Place the baking sheet in the fridge for at least an hour. Overnight is better. Vinegar, salt and then the spice rub. Pre-heat the oven to 325. 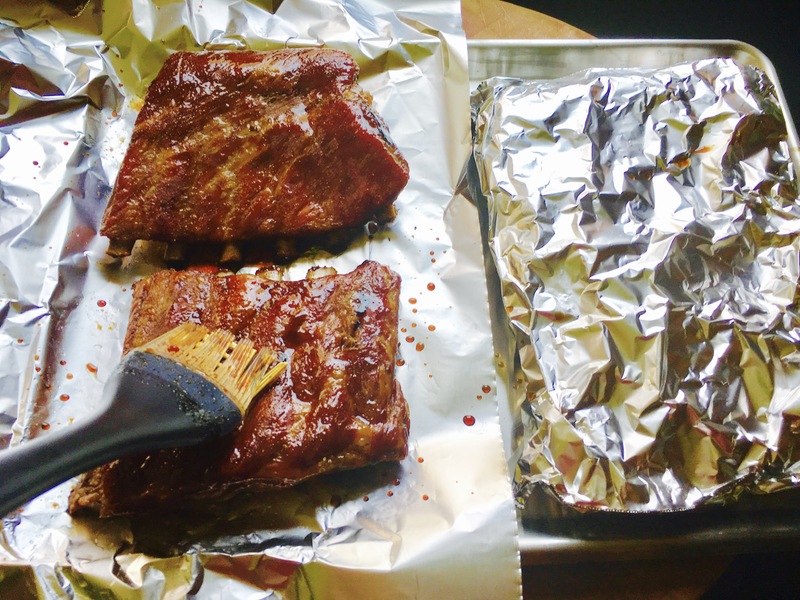 Transfer the ribs to a large roasting pan, or you can use the rimmed baking sheet. Place the ribs fatty side up, and add 1/2 cup of water to the pan. 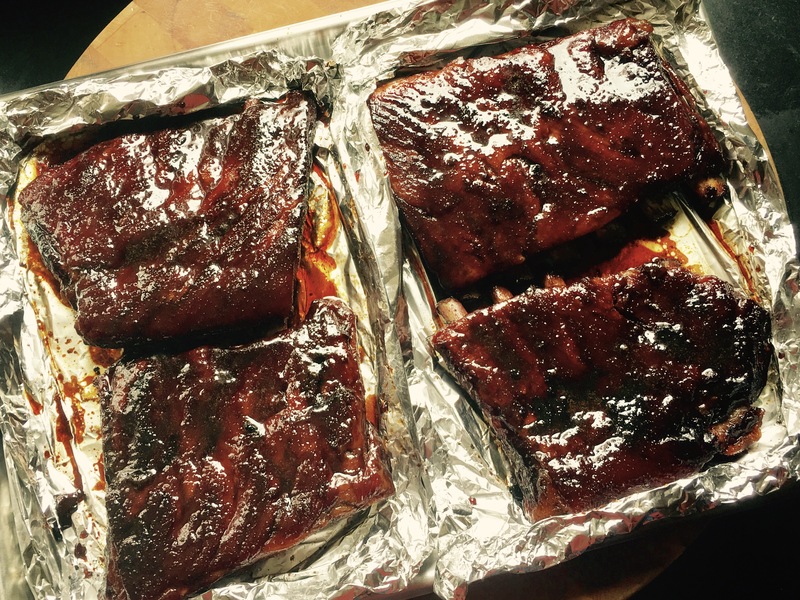 Cover the ribs with aluminum foil and bake them for about 2 hours. 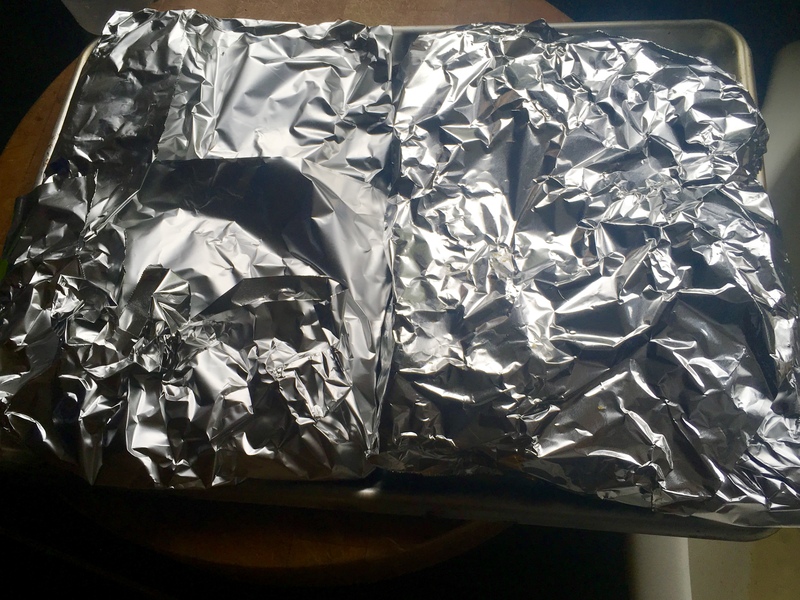 After 2 hours, remove the ribs from the oven and let them sit at room temperature, still covered by the foil, for about 30 minutes. 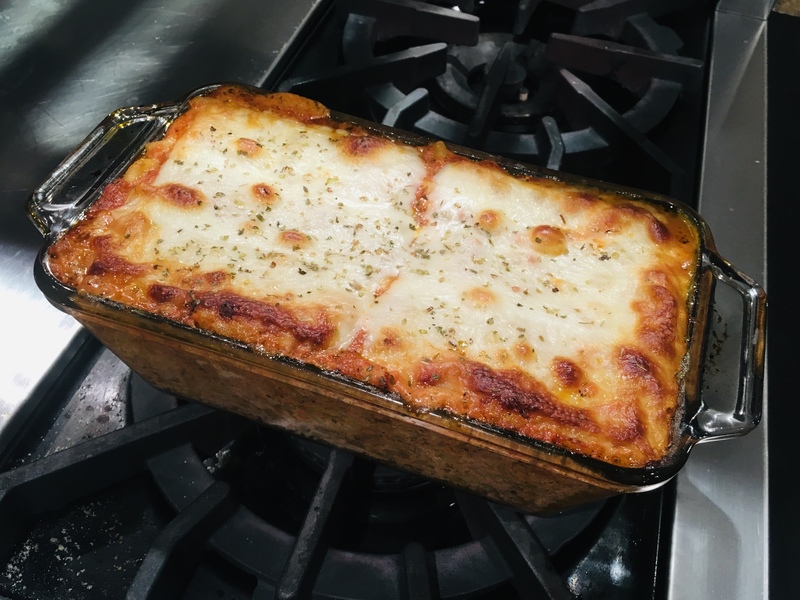 Out of the oven and ready to be brushed with sauce. 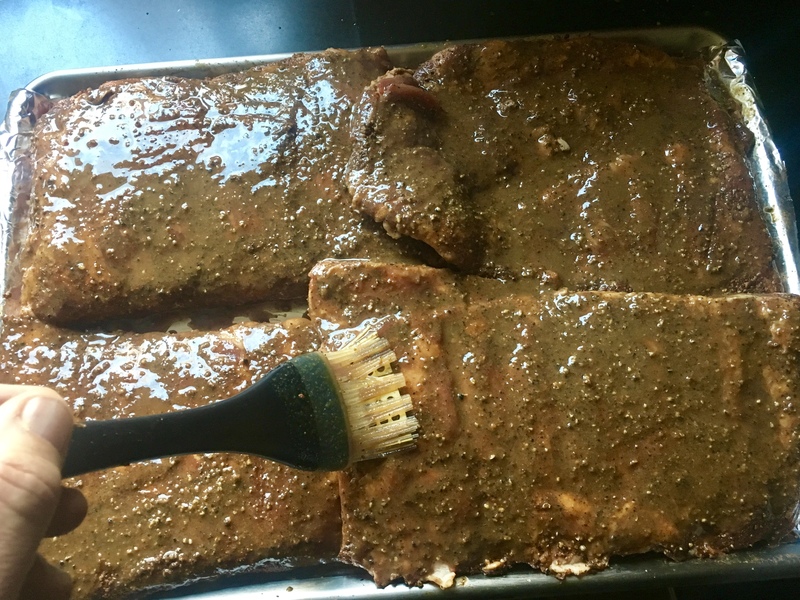 Brushing the ribs with the sauce. 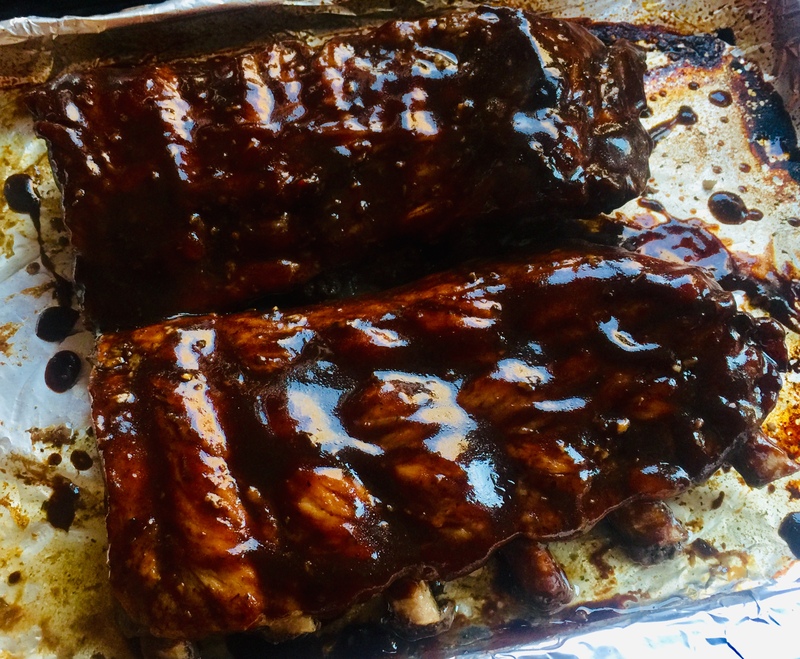 Take the foil off the ribs and brush them with the sauce. Then place the ribs under the broiler until lightly charred, about 3 minutes. Slice into individual ribs or devour a slab at a time! 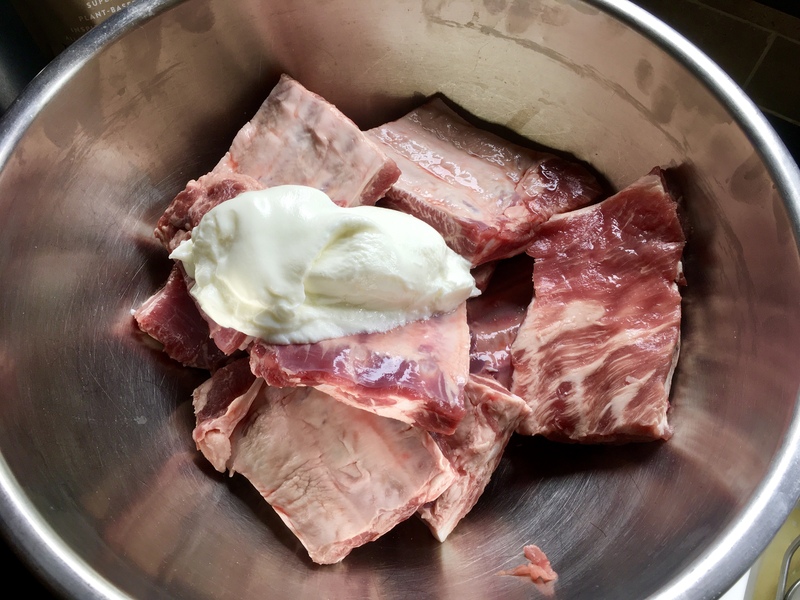 Now that I’ve shared details of my love affair with pork jowls, aka guanciale, in my earlier blog, it’s time to use them in a classic recipe. 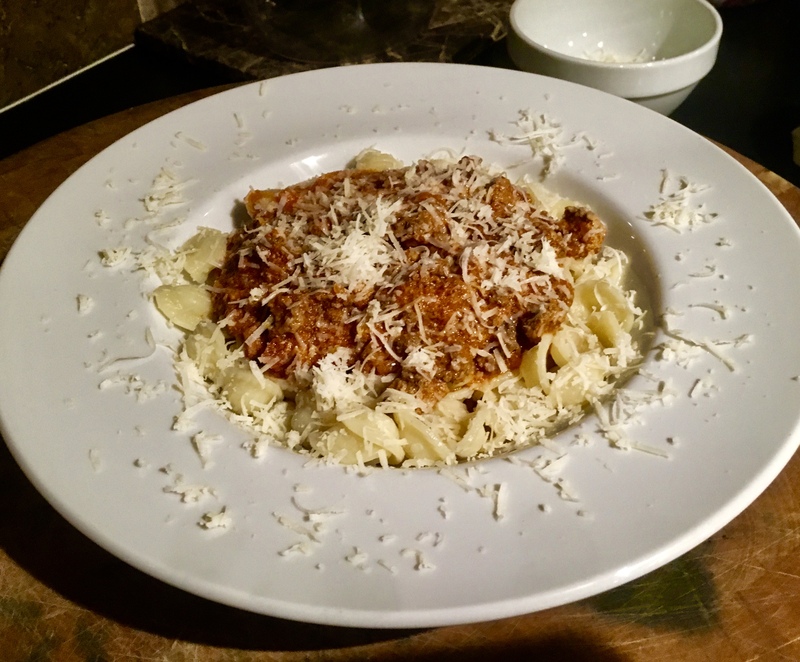 Fettucini alla Bolognese is my daughter’s go-to dish when we visit one of her favorite Italian restaurants, Il Corso, on W 55th St. in New York. 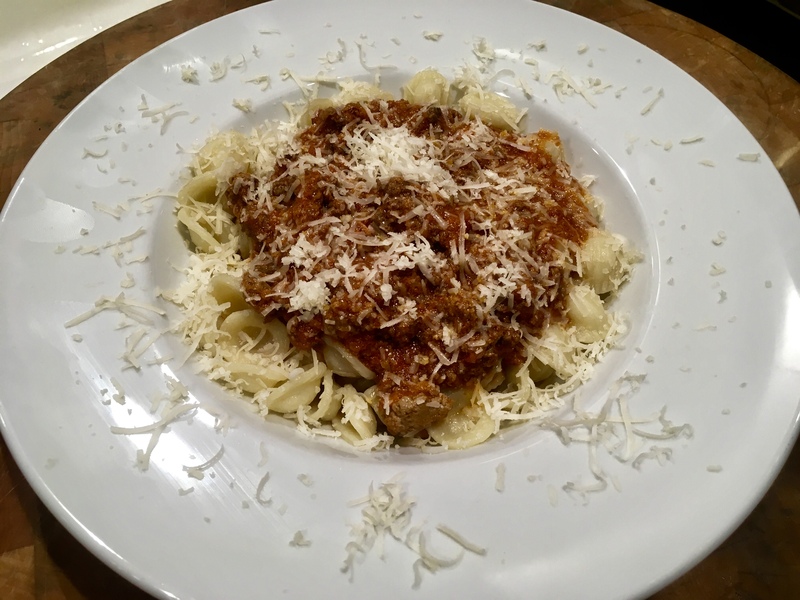 But we only go there once a year, so it was about time I tried my hand at Bolognese at home. The dish isn’t difficult, but like many great dishes, it depends on the best quality ingredients you can get your hands on. 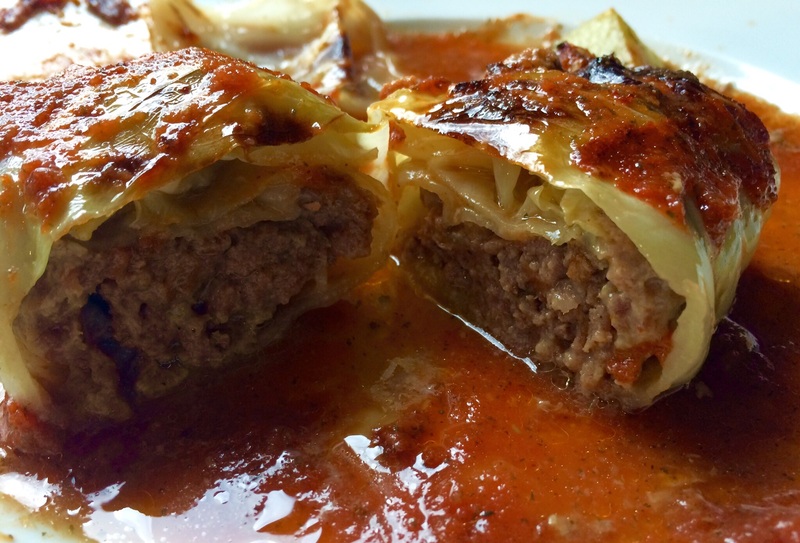 Much like meat loaf, I like to use a combination of ground beef, ground veal and ground pork. But I don’t sweat it too much if I don’t have all three, substituting a little more of one or the other, depending on what’s in my freezer at the time. I use grass-fed ground veal that I get down the road from a local dairy farm: Sweet & Salty Farm in Little Compton, RI. 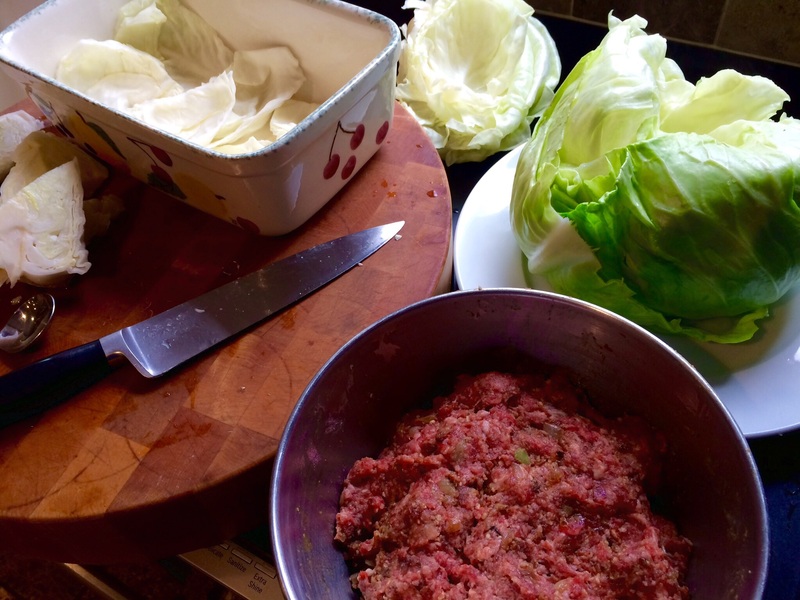 I use ground Berkshire pork, full of “good fat.” And I use grass-fed beef from local farms. Guanciale, a cured pork product that comes from the cheek (jowl) of the pig, is something that I prepare myself. I buy the Berkshire pork jowls raw and cure them at home. (That’s another blog!) If you can’t get your hands on guanciale, a nice slab of bacon will do the trick. The rest of the ingredients are organic, when available. 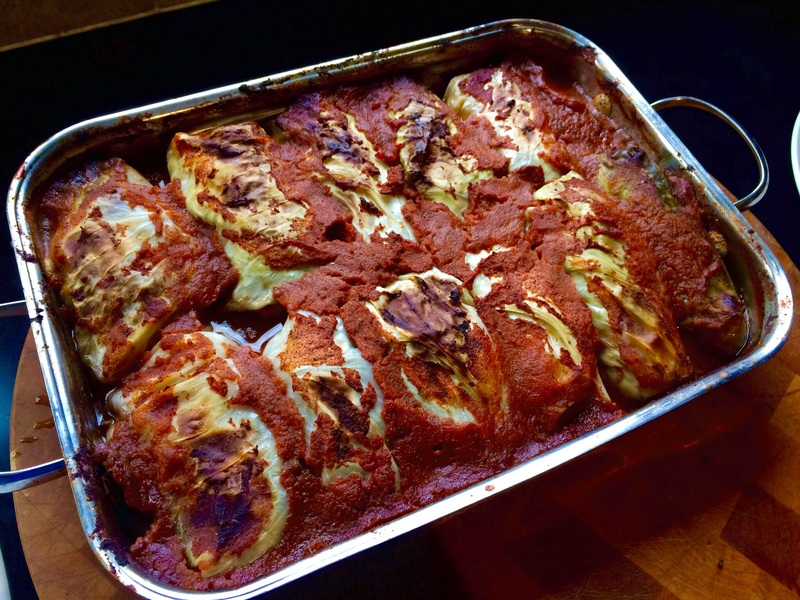 This recipe probably feeds a dozen people. I make a lot at once because it takes time to put it together and let it cook on the stove, and it freezes really well. I place leftovers in tightly sealed single-portion containers in the freezer and then re-heat them when my daughter gets the craving. How much pasta you make with this fish depends on how many people you’re going to serve. Place the olive oil and butter in a large sauce pan with a heavy bottom over high heat. Once the butter has melted, add the guanciale or bacon, letting the fat render out. When it’s almost brown, add the veal, pork, and beef, stirring constantly. Make sure the meat is broken down into small pieces and completely browned. Add the finely chopped onion, carrots, celery and garlic, stirring well. Sweat the veggies for a few minutes, letting them get nice and soft. Add the tomato paste, the ground tomatoes, milk and wine, stirring well. Allowing it to come to a boil will activate the tomato paste’s thickening power. Let it boil for a minute, then reduce the heat to medium-low, and let it simmer for at least 90 minutes, stirring occasionally. 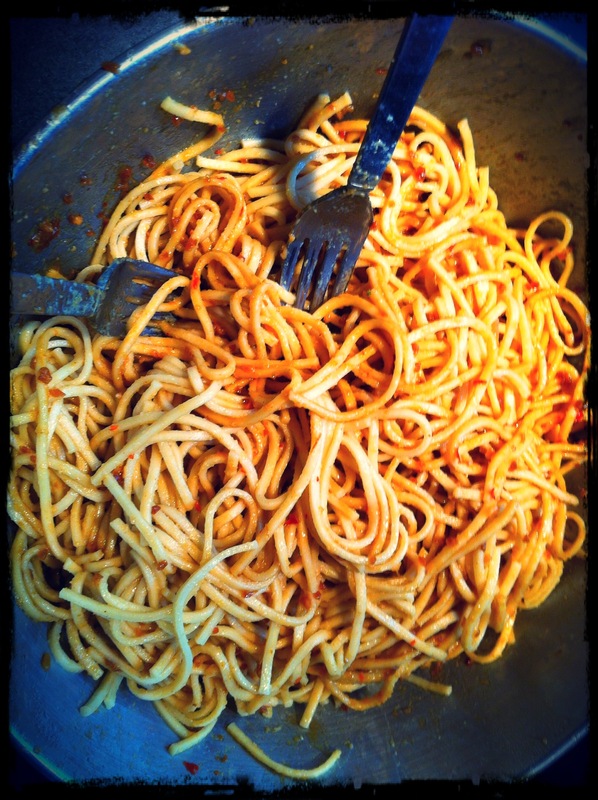 Add the ingredients one step at a time until the sauce comes together: 1) guanciale, 2) meat, 3) veggies), 4) tomatoes. 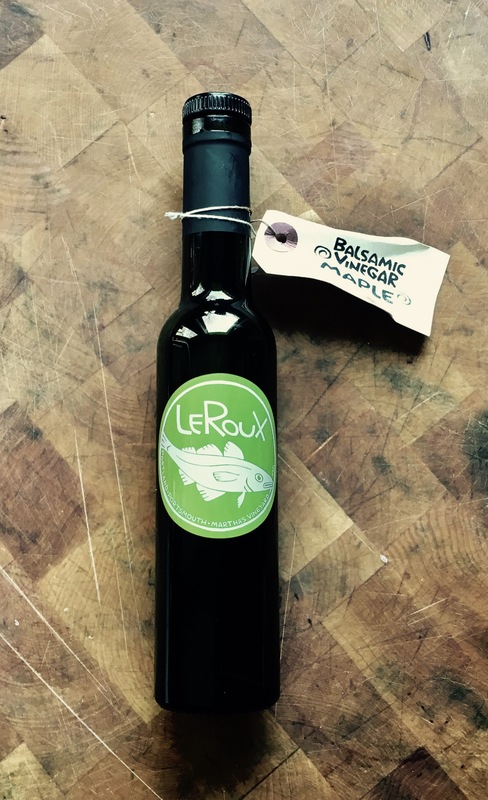 You don’t want the sauce to be runny, and you definitely want to give it enough time on the stove top for the flavors to blend and for the alcohol in the wine to evaporate. 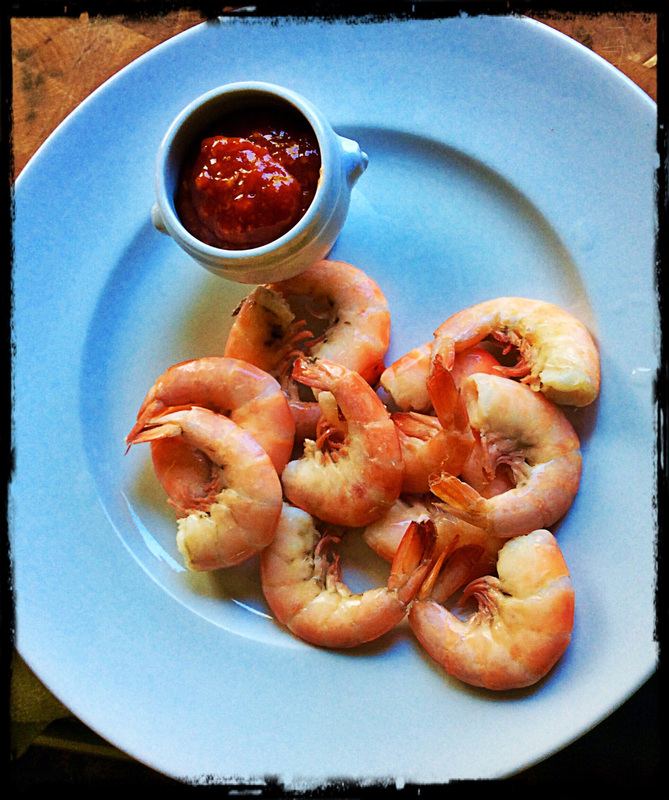 Carefully give the sauce a taste, and season it with salt and pepper. 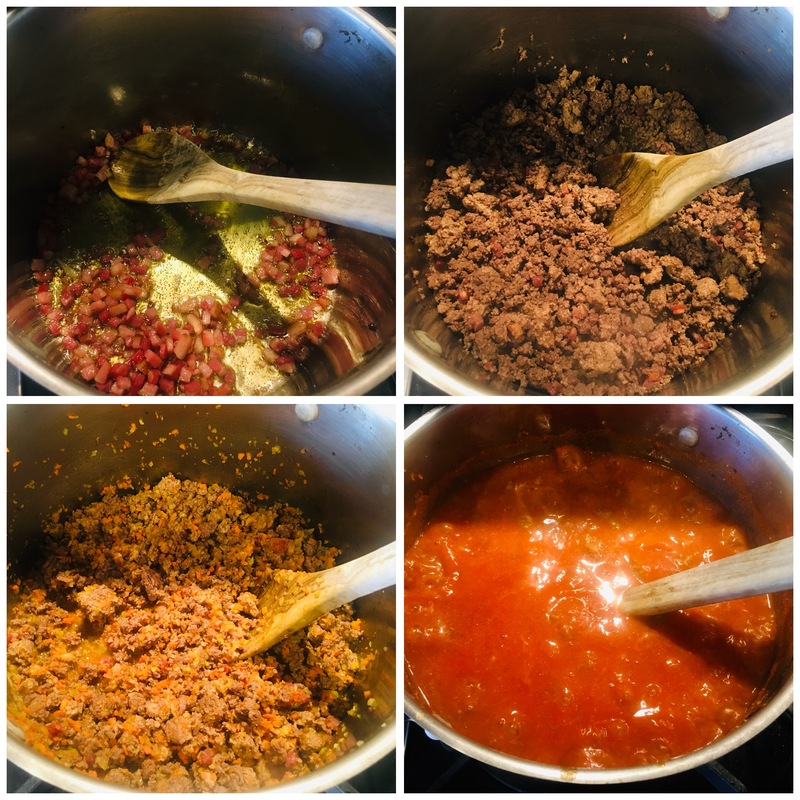 Traditionally, ragu Bolognese is served by placing a part of the cooked pasta in a pan, and adding just enough sauce to have it cling to, not drip from, the pasta. It’s not soup! Top it with freshly grated Parmigiano Reggiano cheese. So I’m watching a video of Andrew Zimmern grilling chicken wings using an apricot-mustard glaze after he marinated them in yogurt and threw them on a hot grill. They looked amazing. 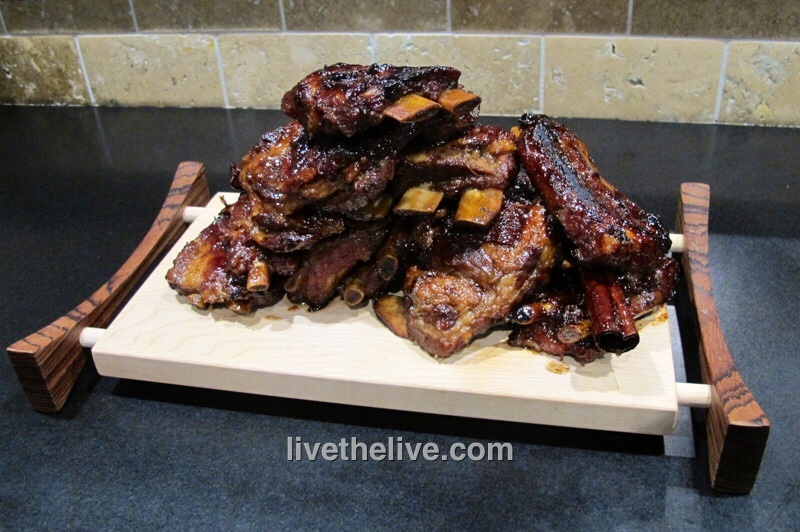 But I had ribs already thawed in my fridge (Curve ball 1). I thought: How bad could this recipe be on pork? I gave it a shot. Combine the ingredients in a bowl, whisking them together. Set it aside. I got a large bowl out, and cut the ribs into smaller pieces, about 3 ribs per piece. 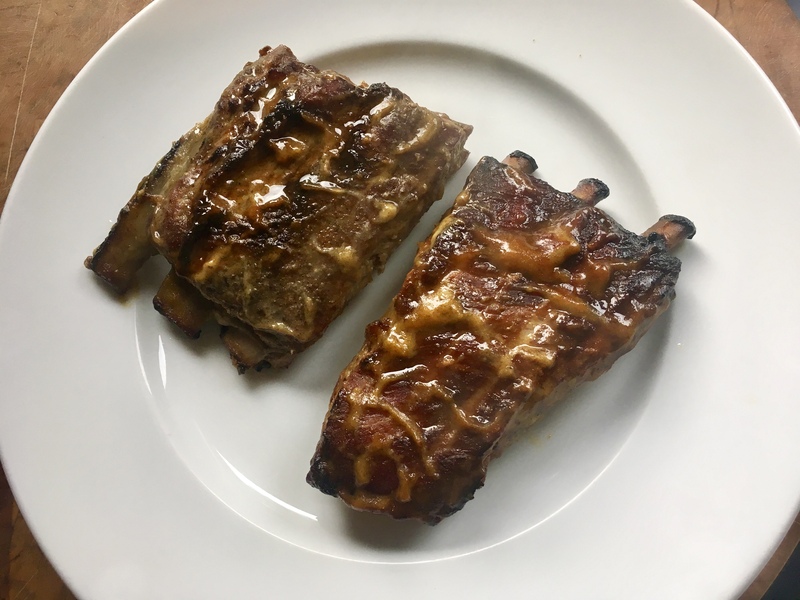 I placed them in the bowl, threw in about a 1/2 cup of plain yogurt, and mixed it around until all sides of the ribs were coated. 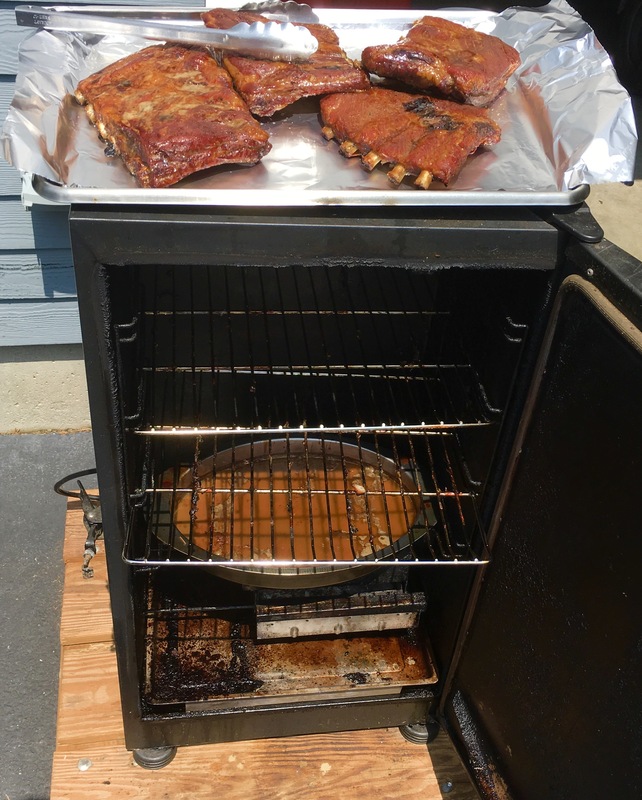 I let the ribs stand this way at room temperature for about an hour, while I headed to the grill to set it up. 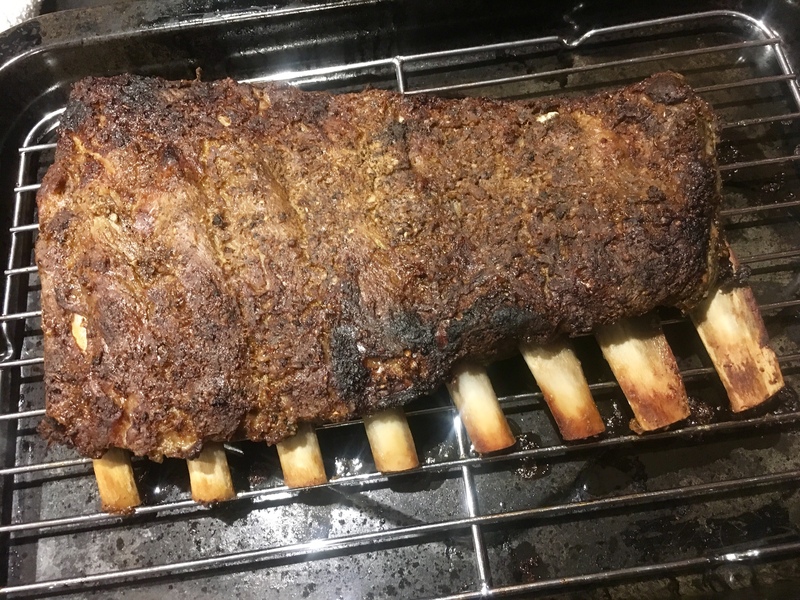 The plan was to light a decent amount of coals that would ash over and then be pushed to one side of the grill, placing the ribs over indirect heat on the other side. They would cook this way until done, with a nice grilled smokey char on the edges. That’s the little mouse home on the left. Unfortunately, when I opened my grill, I found that a family of mice had made themselves a happy home inside my grill, and I didn’t have the heart to toss them out, babies and all. (Curve ball 2.) So I needed to find another way to cook the ribs. I headed to my smoker. I have an electric digital smoker, which allows me to set the temperature and basically walk away, only returning to add smoking chips every hour so. I set the temperature to 275 degrees. 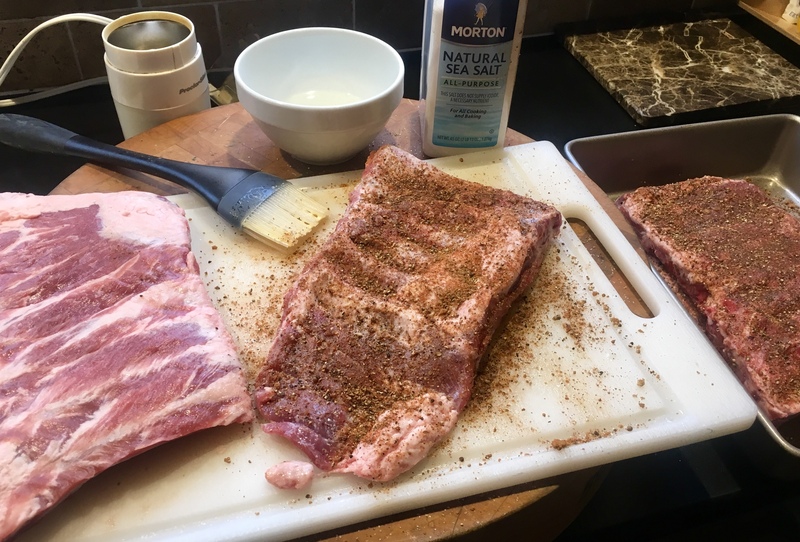 I removed the ribs from the bowl, placing them on a cutting board, sprinkling one seasoning on half the ribs, and another seasoning on the other half. The first half got my favorite basic seasoning: Lawry’s Seasoned Salt. 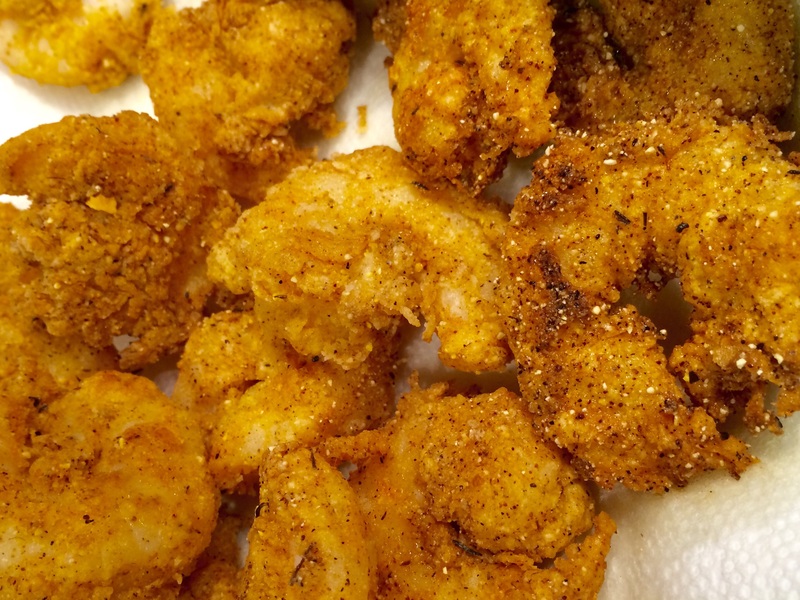 The second half received my favorite Cajun seasoning: Tony Chachere’s Original Creole Seasoning. The ribs went into the smoker for about 2 hours. 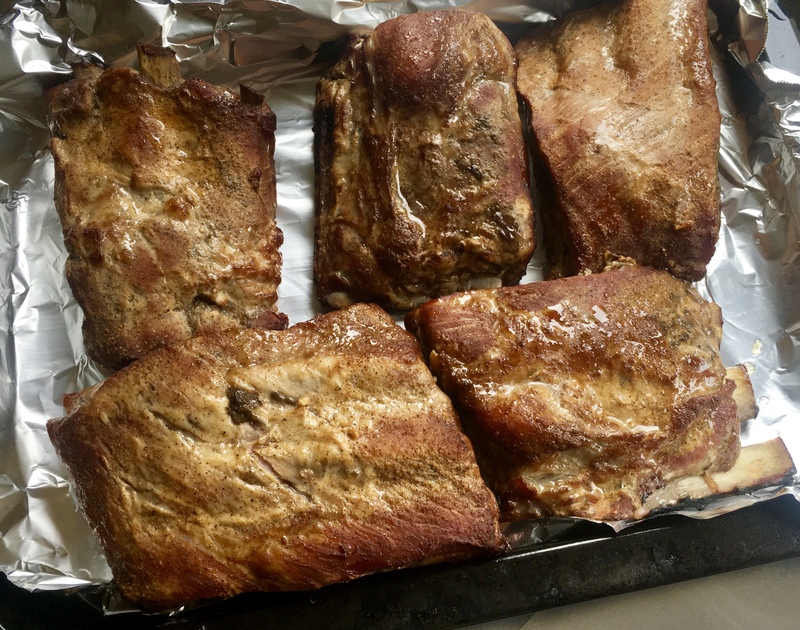 I took the ribs out of the smoker, one half batch at a time, and placed them under the broiler of my toaster oven, flipping them over once I saw the edges of the ribs get nice and dark. 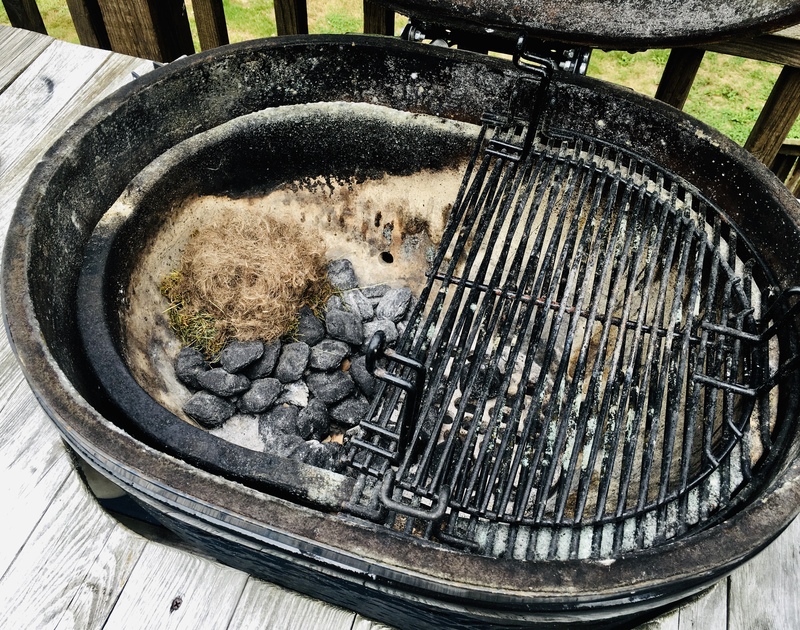 This gave them a bit of that char I was looking for that the grill would’ve given me…had I not had a family of mice in my way! After a few minutes under the broiler. 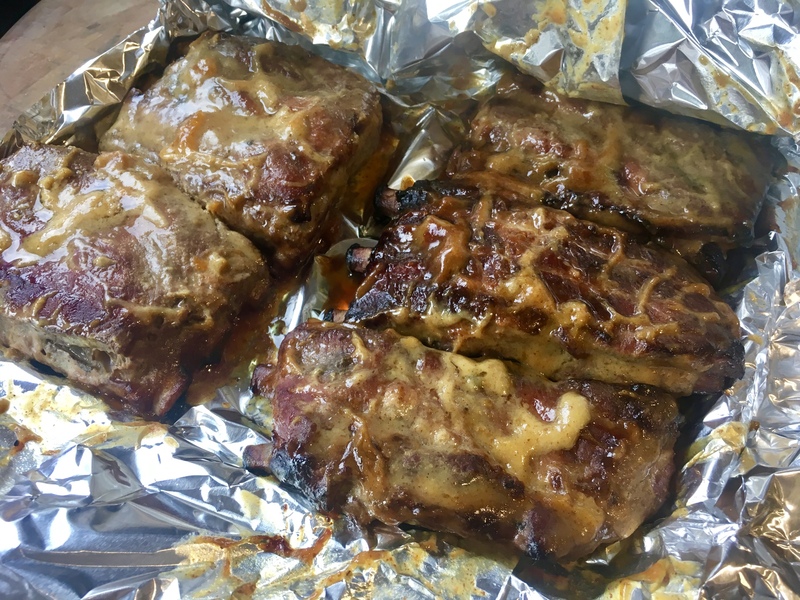 After broiling the ribs on both sides, I placed them in aluminum foil, brushing them on both sides with the apricot-mustard glaze, wrapping the aluminum tightly around them in 2 packages. 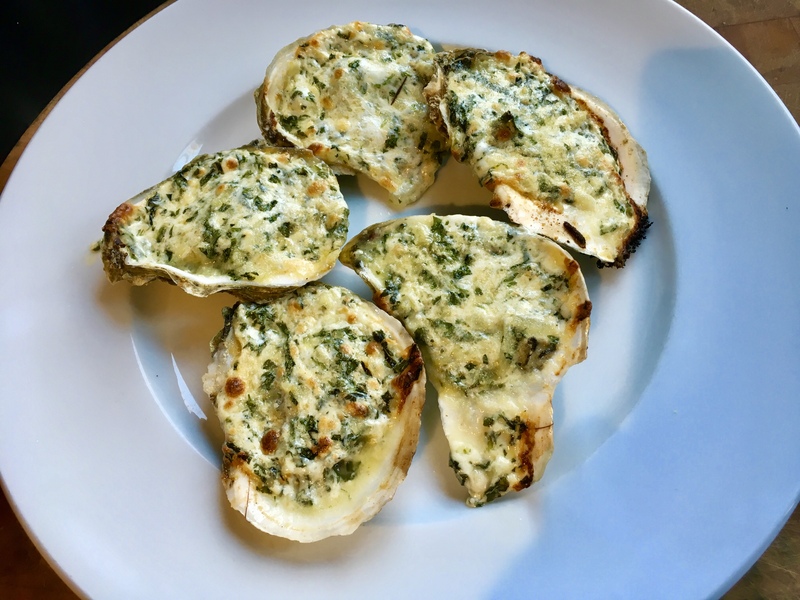 I placed them on a baking sheet and into a pre-heated 175-degree oven. 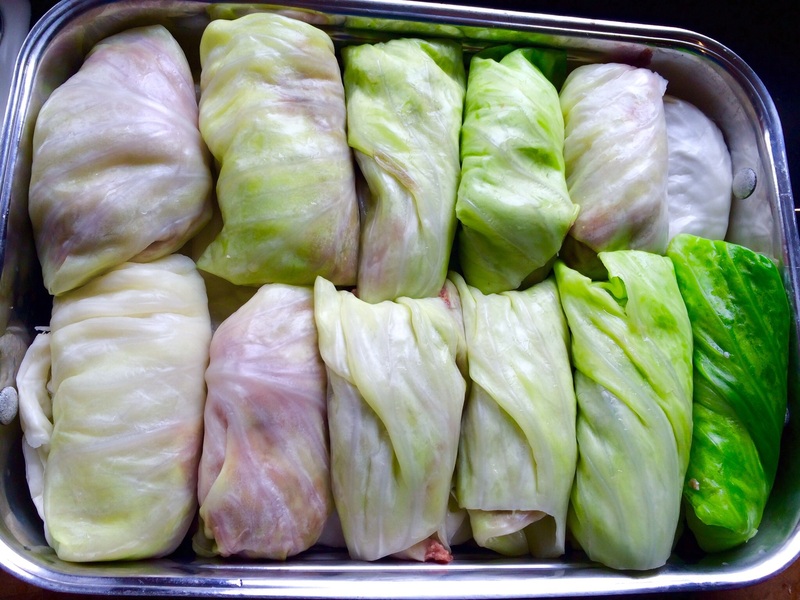 Tightly wrapped and into the oven they go. 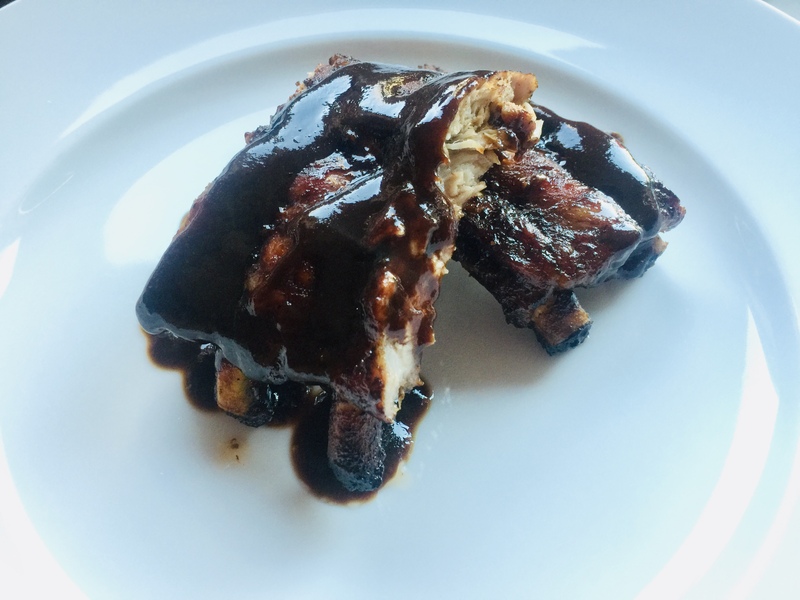 The low temperature in the oven would continue to cook the ribs low and slow, and the glaze would add a little steam to make them tender, and hopefully, delicious. Off to school and guitar lessons I went. Unwrapping the ribs after a few hours. 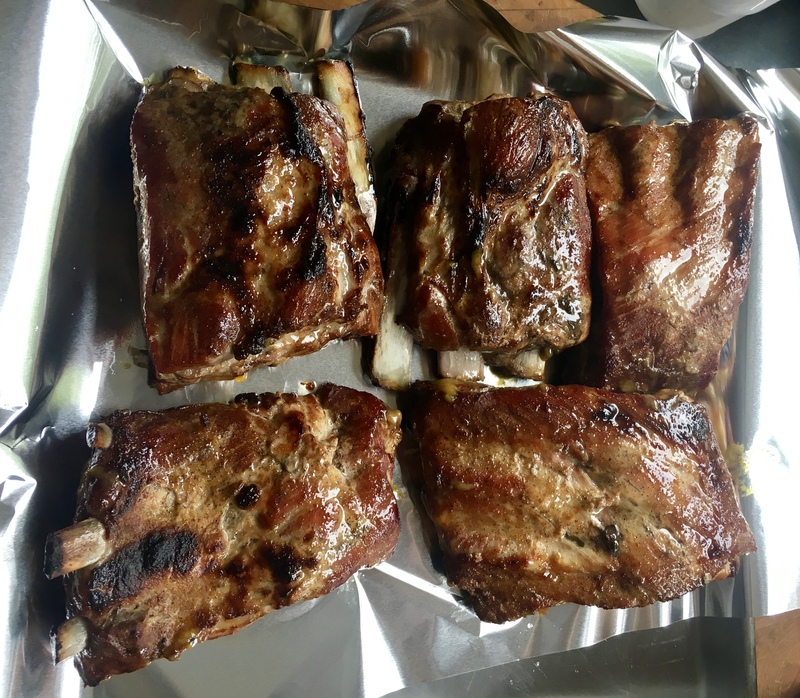 We returned a few hours later, and I placed the sheet pan with the ribs on the top of the stove to cool for a bit, allowing the ribs to rest. One of each: with Lawry’s and Tony Chachere’s. 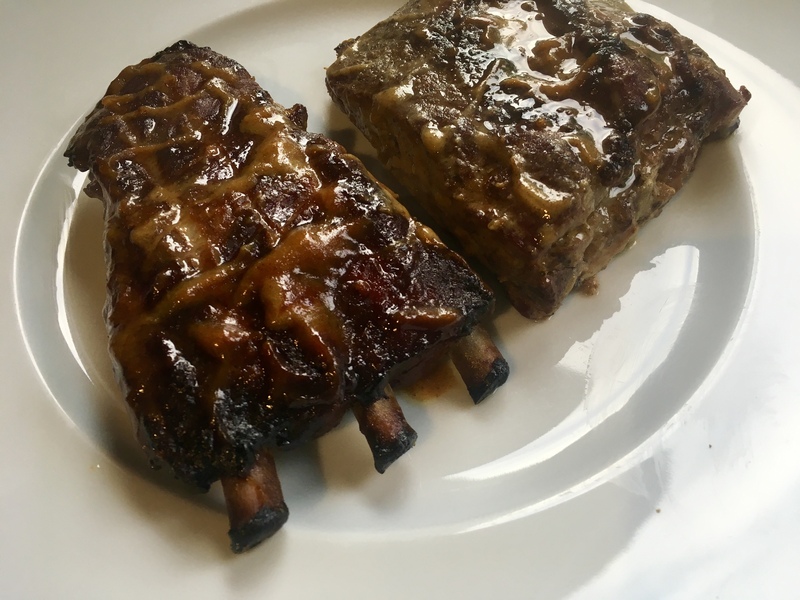 Using a bit more of the apricot-mustard glaze, I brushed the ribs one more time and placed them under the broiler one last time before feasting. It was worth that extra effort to get them nice and caramelized. The final verdict: They came out great, but I preferred the ribs seasoned with Tony Cachere’s better. The Cajun seasoning added a nice kick of heat to counterbalance the sweetness of the apricot-mustard glaze.